Gently flowing, picturesque river with grassy banks, sandy river bed with volcanic structure. Walk and wade fishing to wild rainbow and brown trout. The Madison River starts in Yellowstone National Park where the Firehole River and the Gibbon River come together at Madison Junction. From here the river calmly flows Northwest, for approximately 15 miles, past West Yellowstone, Montana, and into Hebgen Lake. This section of the Madison River is walk and wade fishing only. No boats, Yellowstone National Park rule. The good news is this is a wade friendly river with a sandy river bed with the occasional volcanic rock structure and the occasional blanket of weed beds. The Madison River in YNP opens to fishing on the Saturday of Memorial Day weekend each year and anglers can continue to fish through the first Sunday in November each year. This being said, the opening weekend also coincides with our runoff and water conditions could be none favorable until the cubic feet per second (cfs (see below river flow chart for up to date flows)) and clarity clear up, usually early-mid June. Once the conditions are favorable the famous salmon fly hatch will be in full swing which is a great opportunity to catch a larger hold over fall brown trout on a dry fly, early-mid June. During the salmon fly hatch, you will encounter several other hatches that will often be more productive on days than the salmon fly. These hatches include Pale Morning Duns, Baetis, and caddis. 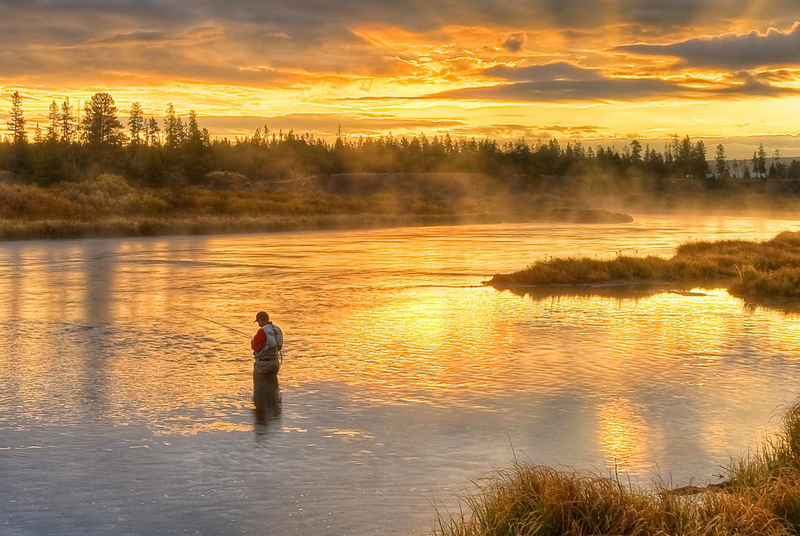 The Madison River in the park hosts wild rainbow and brown trout ranging in size from 10″ to 28″, but averaging 18″. Living in an internet driven world, the fall spawning run out of Hebgen Lake is not much of a secret anymore. Big browns and rainbows averaging 19 inches with the occasional 28″ brown are caught each October into November. When fishing in the fall be ready for winter conditions were temperatures can drop below zero on any given day. Be prepared with several layers and several backup items including gloves, hats and warm socks. NOTE: Felt sole boots are banned from all waters in Yellowstone National Park. Trout On The Fly offers non-felt rental gear if needed.